Working at Heights pose risks no matter how high or low you are working. If your job requires working at heights you may need additional training as this is a high-risk area and you will need to meet the working at height regulations and have and practice using the correct equipment. When working at heights were not just talking about working at the top of a ladder, this could be an instance where your using step ladders or need to climb up anything. The Work at Height Regulations 2005 were introduced as falls from height are the most common cause of death in the workplace and a major cause of serious injury. These regulations apply in any situation where there is a risk of a fall from any height including falls below ground level. The regulations do not state a minimum or maximum height. The Health and Safety Executive has produced a guide to working at height, we have put a link to this in the student resources section of this course. Make sure the whole site where the work is being carried out is suitable, safe and that all equipment is tested, checked and maintained correctly. This includes ensuring that there are no fragile surfaces like roofs that could give way, problems with roof lights or fixings, problems with corroded areas, sharp surfaces or slip hazards. When working at height the correct personal protective equipment must be supplied and worn and the correct training given in its correct use. It is the responsibly of employees to report and not use any equipment that is damaged or not fit for purpose. Special equipment may be needed when working at heights including harnesses or safety lines. Serious medical conditions can result in being stuck in harnesses so you need to be specially trained in using this equipment. It is important that the person who will be carting out the work from a height is a competent person and free from medical problems that could cause problems. It may be oblivious to say this but the person must also have not a problem with heights. In the average workplace working at a height just means using small platforms step ladders, anybody using them should be competent and medically fit, there is no point getting someone with a bad back to use a step ladder. Anytime step ladders or movable platforms are used you need to make sure they adhere to the companies risk assessment, such as making sure they have non-slip rubber feet on them or having two people use the ladder, one person to go up the ladder and the other to make sure it doesn’t move. Appropriate warning signs should be used in the area where the work is being carried out. 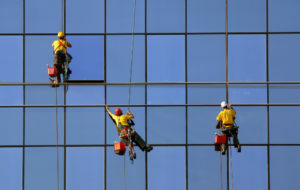 The hierarchy of working at height is to first avoid the work where possible, then to use equipment or other measures to prevent falls while working at height like the use of cherry pickers and finally when the risk cannot be eliminated, to use work equipment to reduce the risk and consequences of a fall should one happen.